New media and postmodernist artistic trends, however, did not appear in the Arab world until fairly recently and even then, they have developed in different rhythms following the particularity of each country and its economic, social and political conditions. Some artists who have made an impact on the local as well as international cultural scene include Palestinian-Lebanese artist Mona Hatoum, the late Emirati Hassan Sharif, the Lebanese Mounira Al Solh, the Moroccan Mounir Fatmi and the Algerian Kader Attia. With the start of the third millennium, postmodernist trends also began to make their way into the Syrian artistic atelier. The era has witnessed a relative openness in comparison to the 1980s and 90s, when conditions were not yet ripe to receive such a style of art. Even though a considerable number of the faculty members at the Academy of Fine Arts in Damascus had studied art in Europe during the 1960s and 70s, that era that witnessed such a revolutionary turn in the concept of art, most of them remained advocates of the traditions of the easel. They were cautious when dealing with conceptual influences and even fought against those artistic newcomers to our region. Economic factors may have also been an additional factor in the non-proliferation of those arts and their new media. How could one market an installation or a performance presentation? Who was going to fund such production? Perhaps the work of the artist Ahmad Moualla (b. 1958) was one of the first endeavours that revolted, however timidly, against the ‘traditions’ of exhibiting art and the ‘norms’ of the easel. This is evident in Miro in Three Dimensions (exhibited at the French Cultural Centre in Damascus in 1995) in that it took the form of a workshop held together with his students at the Academy of Fine Arts, where he worked as a professor of visual communications. Another example is his 1997 exhibition A Greeting to Saadallah Wannous, held at Atassi Gallery in Damascus. The exhibition, inspired by the themes found in Wannous’s plays, contained murals – predominantly in black and white – depicting gatherings and crowds of people. What was noteworthy about this ‘experiment’ was the artist’s reliance on media that was new to the Syrian atelier at the time: water, glass, lighting, music and sand, as well as the text that accompanied the exhibition in the form of a book. Here, in addition to Moualla’s drawings, was a dialogue between Dr. Mary Elias (professor at the Higher Institute of Theatrical Arts and Dean of French Literature Department at the University of Damascus. 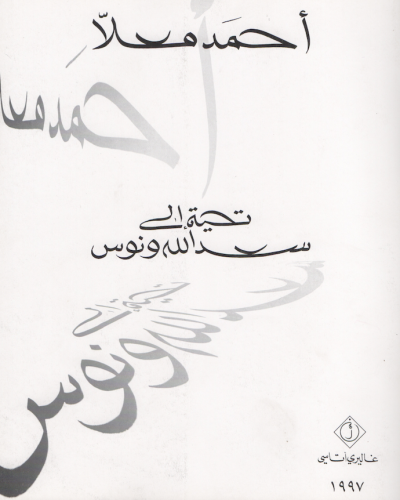 Currently teaching at the Saint Joesph University in Beirut) and Wannous, as well as another text by the poet Nazih Abu Afash and a contribution written by Moualla himself. Undoubtedly, the desire of the artist, who had studied in depth at the Higher National School of Decorative Arts in Paris, was to dramatise the method of presentation so as to bring the audience closer to Wannous and involve the former in an interactive viewing process: that of an installation. Six years later at the same gallery multimedia artist Buthaina Ali (b. 1974) presented her first exhibition, Promises, which also possessed with merit the characteristics of an installation. It included unfamiliar elements in the composition of a portrait, such as barbed wire, wooden crosses, military boots and charred puppets as well as new media like video. Together, they sought to convey a message of protest against war and violence and Israel’s hollow promises of peace in addition to a criticism of the media in the Arab world. One could argue that Ali, who had pursued studies at the Ecole Nationale Supérieure des Beaux-Arts  in Paris, is one of the founding members of multimedia and conceptual art in the Syrian atelier. She has played an essential role in shaping a relatively open mind towards Postmodernist arts, specifically with students of the Academy of Fine Arts in Damascus where she has worked as a professor of drawing and painting. She also contributed to challenging the rigid views of conceptual art and new media. 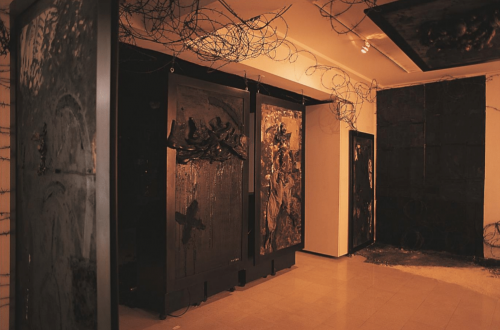 With the support of foreign cultural centres in Damascus and some local galleries, she was able to bring in contemporary experiences and works and organise shows and workshops alongside European artists. Most importantly, Ali’s efforts helped to host Syrian artists who lived abroad. Such was the case with Faseeh Kiso (b. 1956), who, in 2005, exhibited a retrospective exhibition of work dating from the 1980s across three different venues: the French Cultural Center, and the Atassi and Mustafa Ali galleries. The artist, who later established a centre for visual arts in his birthplace of Alhasaka, is credited for his boldness and use of new media in Syrian art, particularly in the realm of body art. Like the American Chris Burden or the French artist Orlan, he also performed a live surgical procedure in front of a Damascene audience. In the same year, the Bukhari sisters, Abeer (an exhibitions trustee) and Nisreen (a multimedia artist) founded All Art Now in one of old Damascus’s houses. It was intended to be the first independent assemblage concerned with contemporary visual arts and new media. From the beginning the project organised workshops for young artists in order to enhance their knowledge of contemporary art and also to urge them to employ new media. All Art Now also took an interest in networking with international festivals concerned with contemporary arts, especially video art, as well as hosting artists from abroad and organising joint exhibitions. The initiative became a platform for experimentation and an exchange of experiences. It remained active in Damascus until 2012, when the war in Syria put an end to its activities. One of the prominent names to come out of ‘All Art Now’ is Nisreen Bukhari herself (b. 1980) who, as aforementioned, contributed to establishing the atelier. Bukhari, who graduated from the Sculpture Department at the Academy of Fine Arts in Damascus, produced several works of a conceptual nature using new media. One such example is the installation A Yellow World of Paper, which she presented in a workshop entitled Here I Stand in 2008. The papers, which contained written personal thoughts, occupied the space of the room, which was painted in yellow. In parallel with her occupation with the easel, the artist Iman Hasbani (b. 1977) was also active during the years All Art Now was operational. Her works incorporated installation, video and performance. 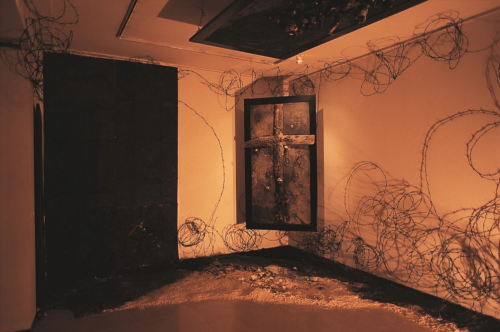 An example includes Personal Memory (2011), which featured human hair as the main element in the work. Hasbani, a graduate from the Academy of Fine Arts in Damascus, now lives and works in Berlin. Other artists hosted by All Art Now, working in various media ranging from installation to performance art and video art include Mohamad Ali, Arfan Khalifa, Ziad Al Halabi, Mahmoud Dyoub, Fady Al Hamawi, Ruba Khuweis, Adnan Jito, Hiba Aizouk, Razan Mohsen and others. It could be said that both the pre-war period and revolution have paved the way for the proliferation of new media and the emergence of the idea of an artistic group represented by All Art Now. However, one could argue that this modernistic endeavor has not forged strong roots in Syria’s art history, but, rather, has been confined within the frame of attempts to keep up with what is happening in contemporary Western art. Most of the works produced during the war and revolution period were keen on creating a shock similar to that created by the daily violence lived in Syria. Furthermore, the extraordinary and accelerating changes taking place on the tragic Syrian scene during the past eight years have led to shifts in the relationship between the artist and the Syrian cause. This has been reflected in the artist’s relationship with his tools and creative production. 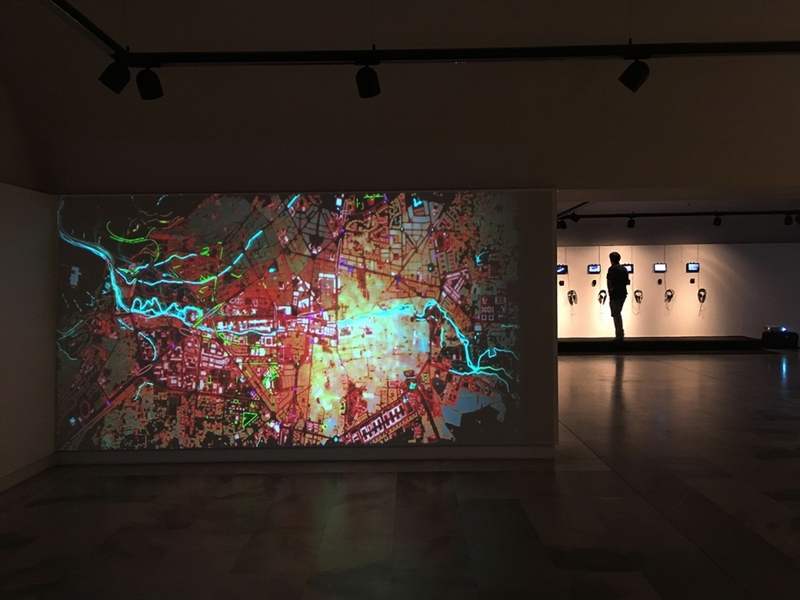 Several artists, the majority of which had left the country, have started using new media in the countries they have taken refuge in and, as such, bringing forth the theme of war through new media. In his work A Syrian Child or Olive Grove (2012) by Akram Al Halabi (b. 1980), who comes from the occupied Golan, we see four bodies of children on which are inscribed some words in English such as ‘hand’, ‘eye’, ‘face’, ‘arm’, ‘foot’ and ‘child’. It is as if the artist wanted to identify those dead bodies by naming their organs. The image, done in Photoshop and taken from a video shown online following the 2012 massacre of Karm Al Zaitoun (near Homs) belongs to a collection of works Al Halabi has dedicated to the revolution whereby the artist, who now resides in Austria, proposes a new relationship between image and writing and, in doing so, death and art. The effect of this massacre is also evident in the installation work Promises by fellow Golani artist Shaza Al Safadi (b. 1982), a graduate from the Academy of Fine arts in Damascus. In this work, the artist has etched traces of bodies on Plexiglas while a spotlight drew ghostly shadows across the walls of the space in which the work was exhibited in Ramallah during the Young Artist competition sponsored by Abdel Mohsen Kattan Foundation in 2011. In her interactive installation, Tracing Traces, displayed in Canada, her place of residence, Khadija Baker (1973) proposes we choose from a set of papers placed in front of us and on which are written the names of martyrs from the Syrian massacre. In turn, she etches the names again on blocks of ice and then pours ink over the perforated grooves. A screen shows a mosaic video composed of 25 photographed sections of these ice blocks: the etched names melt over time and we see their traces on pieces of white cloth. Destruction also takes up the works of Tammam Azzam (b. 1980) both in his portrait and in the digital works he became famous for at the start of the revolution. 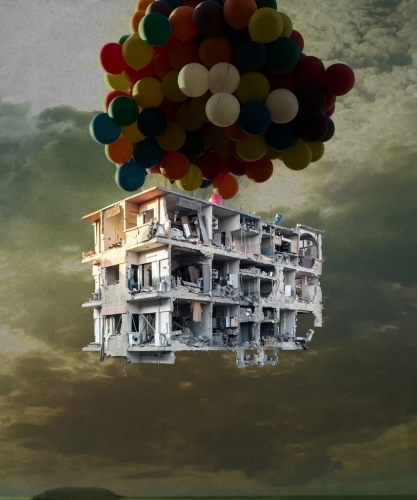 These include the series A Happy Journey (2013), in which the artist – who graduated from the Academy of Fine arts in Damascus and currently resides in Germany – puts together a visual portrait based on a real picture of a demolished building in one of the devastated cities in his motherland. The building is lifted by coloured balloons in search of a temporary homeland in another part of this world. Evoking destruction is also evident in the form of an installation, To Whom It may Concern (2013) by the artist Fadi Al Hamawi (b. 1980), a graduate of the Academy of Fine Arts in Damascus. In it, the artist, who is pursuing his artisCuttic career in Germany, his new asylum, prepares the exhibition location by turning it into rubble, thus simulating the image of ruined houses in Syria. Within that infernal scene (which was displayed at Beirut Art Fair the same year), a television screen is positioned in a way to allow the viewer to see his image in the midst of the rubble. In her installation A Book of Mathematics (2017), Hiba Al Ansari (b.1984) has opted to redefine our relationship with demolished space. The artist, a graduate of the Academy of Fine Arts in Damascus, was inspired by a maths book she found during her stay in the town of Kfar Nabel. The book belonged to a Syrian girl killed during the military shelling of her town. 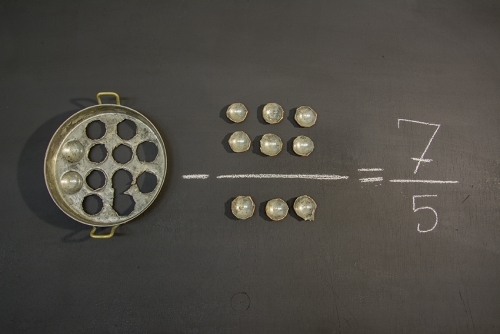 Al Ansari, who pursued further studies in sculpture at the University of Munich, where she currently lives, used cement and sponge to embody the explosion as well as kitchen utensils to build illogical mathematical equations. Other significant post-war works demonstrating this growth in new media include those of the Palestinian-Syrian artist, Bissane Al Sharif (b. 1977) who, in addition to her work as a stenographer, has produced a series of installations centred on the concept of personal testimony. One such example is the project Memory of Women, a documentary artistic installation relying mainly on photographed recordings of Syrian and Palestinian women. This makes them into a fundamental medium that documents their tragic displacement journeys during the war in Syria. 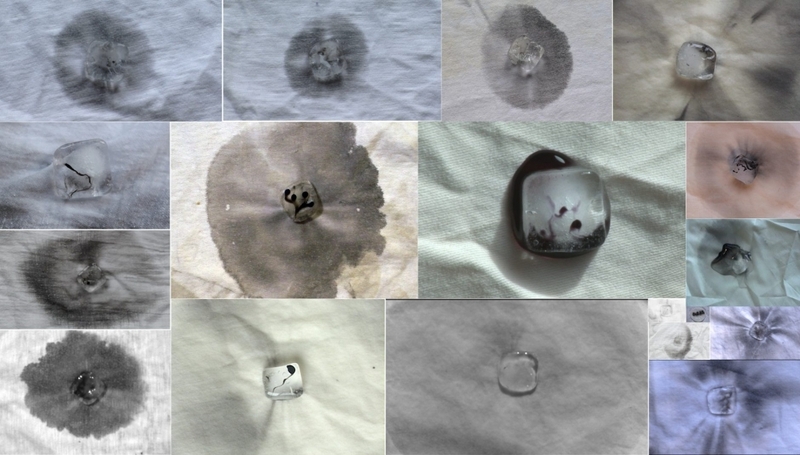 In her latest project, Sham (2016/2017), the artist, who studied architecture in Damascus and then stenography in Nantes, France, combines several new media such as video, audio testimony and pop up techniques (or three-dimensional books). Using the testimonies of children, she recounts to the viewer her relationship with original place and unforeseen changes to create a documentary installation. Some artists who produced work during the war in Syria have depended mainly on digital arts and modern computer programmes, such as Sulafa Hijazi (b. 1977) who has produced a body of work ranging from cartoons (executed through the lenticular print method) or videos integrating three-dimensional drawings with motion graphics. Other works executed with an ‘enhanced reality’ method include her recent Localization (2018) in which she suggests to the viewer they install a certain App to their smart phone in order to see the work as a whole. Once we do this, we find ourselves in front of a portrait comprising several photographs taken on Karl-Marx-Allee (a Communist-era boulevard renamed after Marx in the 1960s) in Berlin, where the artist lives. We only have to direct our smart phones toward the portrait so that we can see three dimensional characters “interacting with the locations in the portrait, trying to find a place for them, between swinging in the place, trying to get rid of it or trying to lean on it”, as the artist explains in her presentation of the work. Dino Ali (b. 1985), who recently completed doctoral studies at the digital department of the Université Paris Eight, composes his installation works based on the concept of anamorphosis, that is, restructuring a ‘deformed’ image by looking at it from a specific point so that, under an optical illusion, it appears real. 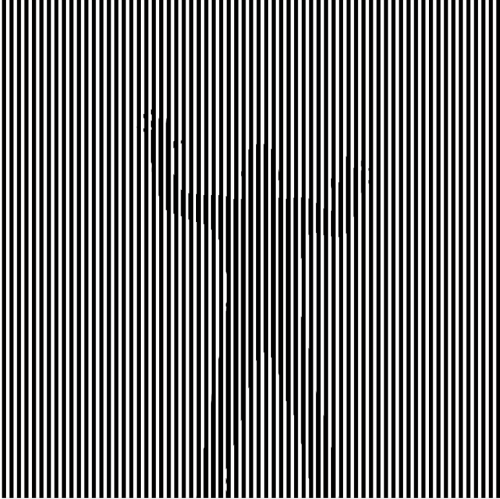 In addition to his interest in video art, he works with the concept of Op Art: optical works that are based on shapes, mostly geometrical, and which carry wavy effects which excite and confuse the eye by implying movement, as in the works of the founders of this trend such as the Hungarian artist Victor Vasarely and the British Bridget Louise Riley. After this quick review of the most prominent artistic migratory experiences, it is safe to say that the effects of postmodernism have firmly taken root in the works of Syrian artists. Hence, it is no longer outrageous to introduce an artist as a multimedia artist, as for example in the case of the artists Khadija Bakr and Hiba Al Ansari. We also notice the uniqueness of some artistic experiences that have not necessarily stemmed from the same academic background, such as those of Bissan Al Sharif, who studied architecture and scenography, or Sulafa Hijazi, who studied at the Higher Institute for Theatrical Arts in Damascus. In this article, it would be impossible to comprehensively review all the experiences based on new media and particularly those related to video art. A separate article should be dedicated to this art to review the date of its inception, its evolution and the most prominent experiences in our region. However, what is important to take away here is how postmodernist trends have fundamentally changed the concept of art within Syria. Today, it is not possible to confine art within typical, rigid and closed definitions. The description of an artist is also no longer exclusive to skilled individuals. Audiences are now involved with the construction process of artworks and new, less traditional media and new techniques have become the foundation for the contemporary process of art creativity. It is true that our relationship with these trends is still problematic, especially in the Arab world (where some consider it a ‘conspiracy’ that aims to destroy the aesthetic taste), however, we must admit that these trends have re-framed our view of the relationship between what is universal and what is common in a new manner. The rise of new media has allowed the Arab artist to be more open to their social environment, motivating them to keep up with the times by employing innovative new materials and approaches and contemporary technology in constructing art.